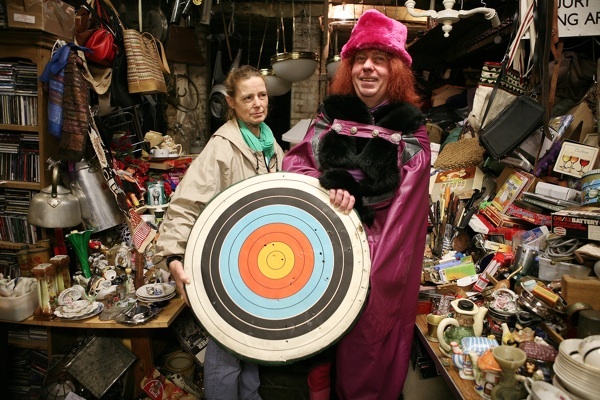 Yesterday, Des & Lorraine closed the door on their legendary junk shop in Bacon St after more than thirty-five years of trading. Rent increases forced the move and in future you can find them at Unit 14, Cromwell Industrial Estate, Staffa Rd, Leyton, E10 7QZ. 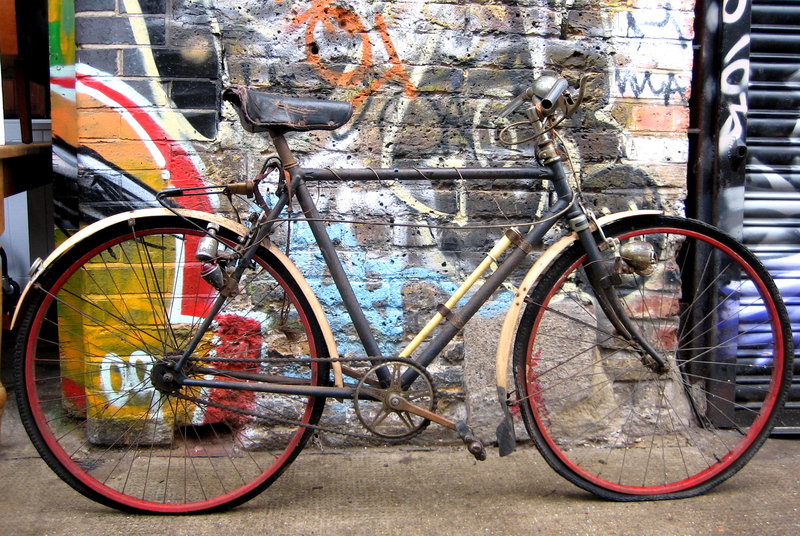 Call Des on 07553 345852 for opening times to discover the cheapest and most interesting collection of junk in London. Des & Lorraine’s junk shop in Bacon St was sandwiched between a secondhand catering equipment dealer and a tattoo parlour, so you might not even have noticed the discreet entrance if you did not know it. You could easily be unaware of the wonders that were contained behind this unassuming frontage. Des led me through the low-ceilinged narrow passage lined with old wardrobes into the shop itself. At first, as you entered this shadowy antechamber, you realised the ceiling was higher and hung with things which gave the feeling of being in a deep forest with heavy branches overhead. Then you found yourself in an old stable with a cobbled floor, a corrugated iron roof and spaces opening up on all sides, each crowded with furniture accumulated in the gloom, giving way to indeterminate darkness. This is where Des & Lorraine dealt in junk for over thirty-five years. Without windows, the chill was tangible, and I understood why Lorraine was commonly seen wrapped in a hat and scarf, and whenever possible sat in the car outside during the winter months. They are busy people by nature and custom, fugutive figures constantly coming and going, collecting and delivering. Consequently, it took me several days to get an opportunity to speak to Des yet even then he was hovering, as customers came and went throughout our conversation. 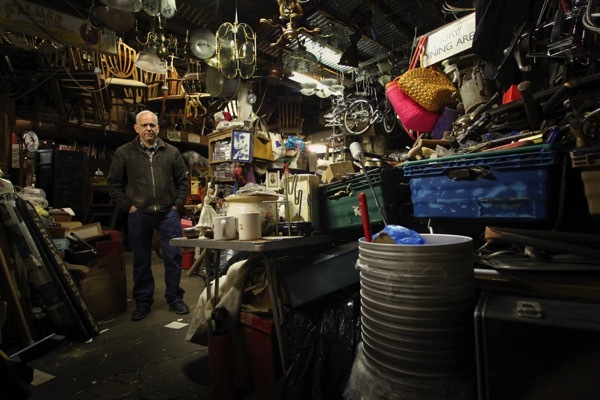 I was impressed that Des describes himself as dealing in ‘junk’ because, while antique dealers may consider themselves superior within the hierarchy of professionals, for the inquisitive customer ‘junk’ possesses the greater interest. With antiques there is an implication of higher monetary value but with junk it is all about the intrinsic poetry of the items. So to my mind, it is to his credit that Des is unapologetically a junk dealer. 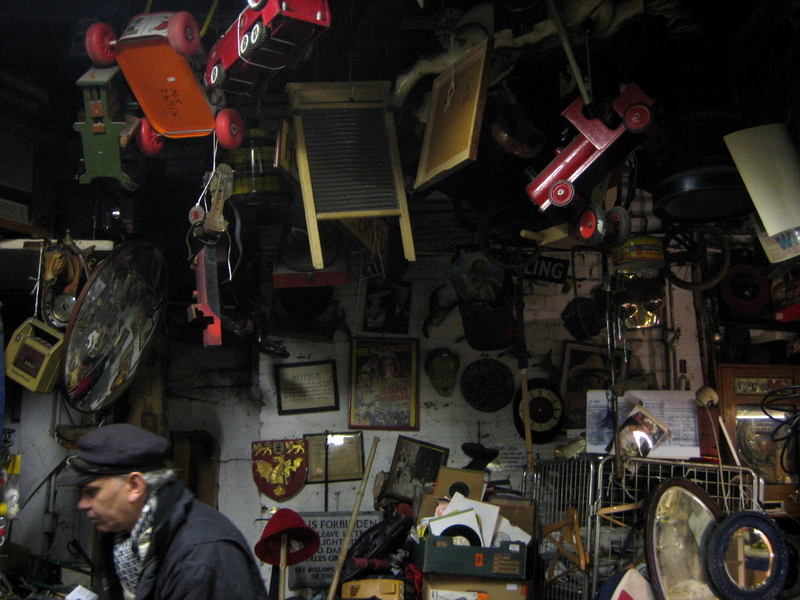 Wherever I looked in Des & Lorraine’s magnificent junk shop in Bacon St, the detail was overwhelming – with a panoply of old stuff hung above, creating the impression of an eccentric galaxy of objects in a frozen moment. 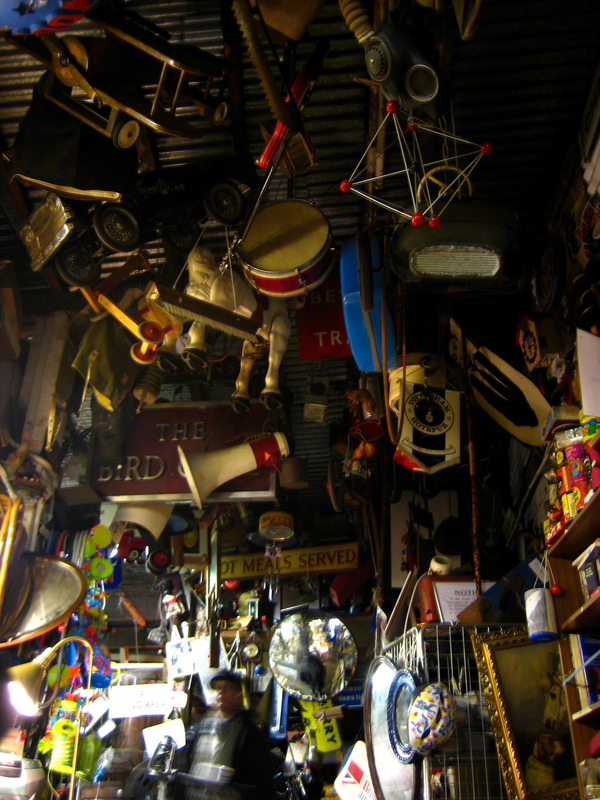 Des certainly likes to collect, especially old toys and other curios that looked good hanging overhead. The airplanes and vehicles created the sense of motion in Des’ cosmos while the other items, like the signs and musical instruments, the gas mask and the giant potato peeler imparted a surreal quality to his strange universe. Gazing up into this thicket was like looking into a dream, yet Des appeared to be a down-to-earth fellow. “Certain things I like to keep. Most of this stuff here is from childhood. A lot of people ask to buy these things but they are not for sale. It’s all stuff that’s become collectible. It’s stuff I bought, except the horse which belonged to my kids and they left it out in the rain.” he explained to me, as he surveyed his marvellous collection with proprietorial satisfaction. Willingly consenting to the notion of a mermaid photographed by a mobile phone, I gave Des my number and said goodbye. 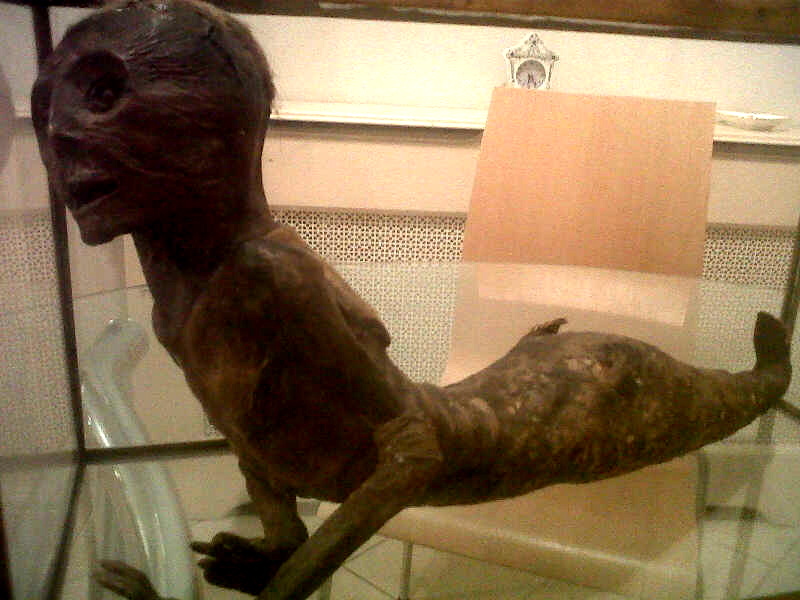 The picture you see below arrived that evening, Des’ mummified mermaid in a glass tank sitting upon his dining table. I shall leave you to draw your own conclusion upon its authenticity as a mermaid, but from this picture I do believe it is an authentic specimen from a nineteenth century display, a cabinet of curiosities or a freak show, and that itself is good enough for me. Des & Lorraine were always happy to allow customers to rummage in their shop, as long as they asked first. It was the last outpost of the mysterious kingdom of junk. Omw, this is my type of shop. Can see myself spending hours rummaging through all the interesting goodies . Heaven on earth. The shop looks like a work of art. 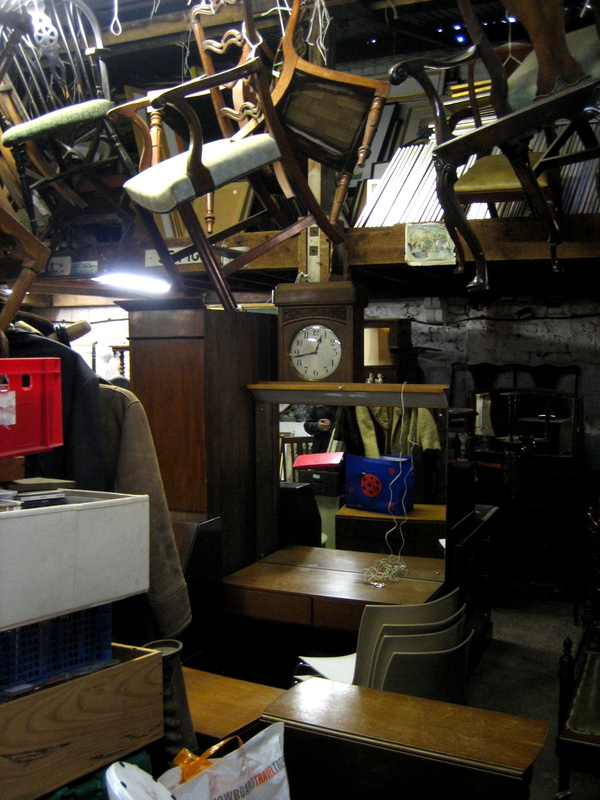 What happens to the contents of a junk shop, when it closes? What’s the next stop, for those things, once the collection is dispersed, its stuff dislodged from this their temporary home (but not final resting spot). — a lovely, fine distinction. This is the kind of place where I’d think I’d died and gone to heaven. You almost never find this kind of treasure trove in North America. I notice the photo of the Viscountess, which must be older. I wonder how is she doing? Loved this article as I do with so many , landing in my email each day, but as I now live in Christchurch on the South Coast it gives me a wonderful sense of time gone by and life as it should be. It’s my first day of a weeks leave and a wonderful way to start the week. I love rummaging around old shops like this. Shame they have to close. What a wonderful world of junk. What a fantastic place to rummage for bargains, such as the glass light fittings behind Lorraine’s head in the last photo. I would love those. Aside from the junk, I enjoyed suddenly spotting the almost ghostly figure in photo two (first photo after the text) and interpreting the look on Lorraine’s face as she surveys the exuberant Countess. So sad that gentrification is forcing out Des & Lorraine. I will miss the adventure of exploring the magical place they created. …and on and on and on it goes, the homogenisation of our City’s streets into identical avenues of glossy, corporate outlets, all selling the same old rubbish to same old people in the same old clothes. 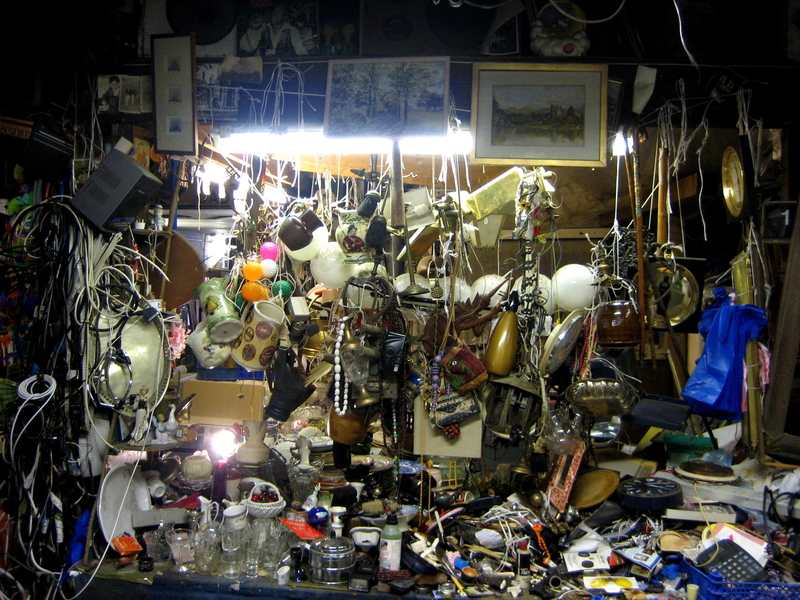 This is a magnificent example of an almost forgotten genre of retail: the junk shop. When I was a kid they were commonplace, as were the rag-and-bone men who plied their trade with a horse and cart and a lusty cry of: “Any ‘ol rags n’ lumber!” and they all looked like Steptoe and Son. I’m glad they’ve been able to re-locate and wish them luck with the new premises. On another note, there’s an identical “Mermaid” on display at the Horniman Museum in Forest Hill. These grotesque freaks are, of course, all fakes but were extremely common in Victorian times when sailors would bring them back from their voyages to the South Seas and beyond. This caused me to look up the meaning of the word rummage and this is what I came up with: ‘to search for something by moving things around carelessly and looking into, under and so on’. I was not surprised as people coming into my shop seem compelled to rummage in any boxes of books that have not yet been unpacked and this describes their behaviour exactly, careless !! There must be something in the human psyche that makes them think that if they turn everything over they will find a treasure that the owner has missed, but I bet that Des and Lorraine will have spotted any treasures with their long experience !! As do we of course. Nevertheless junk shops are fascinating places, and my son has found bits and pieces that fit well into our new premises, door handles, picture frames, jars and plant pots and so on in a local outlet of reclaimed items, which is sadly, the nearest that we have to a junk shop now. Does anyone have a rummage sale nowadays? Jumble sales still seem to exist but rummage sales? I haven’t seen one of those advertised for years despite all those people who love to rummage. It’s wonderful to see Viscountess Boudica. Such a droll sense of humor she has, holding the bullseye up against her body. How is she? Have you seen her? So much the are is changing since I moved 5 years ago… Even tho I am a young one and I should embrace changes it is sad to see what London is becoming. Wow. 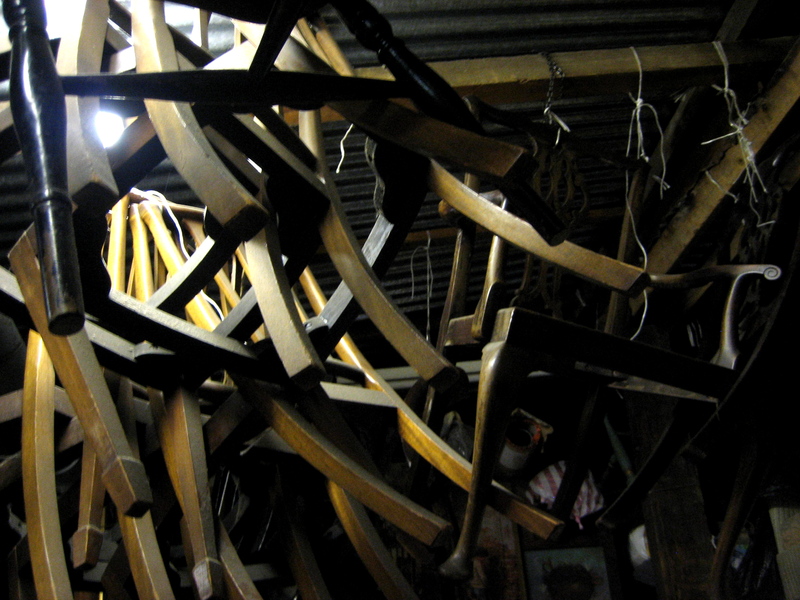 Moving is hell….moving a junk shop would be hell on wheels.